We are now looking for volunteers to join the Kent team after a number of our team have got sick. Kent student Warren twisted his ankle in the campsite and is now out of action recuperating, whilst Susan has also had a bug (though thankfully she is now better). With a hospital visit for Warren, and people looking after both, we lost 5 people total from site, which brought Sebastian’s excavation in the forum to a standstill. 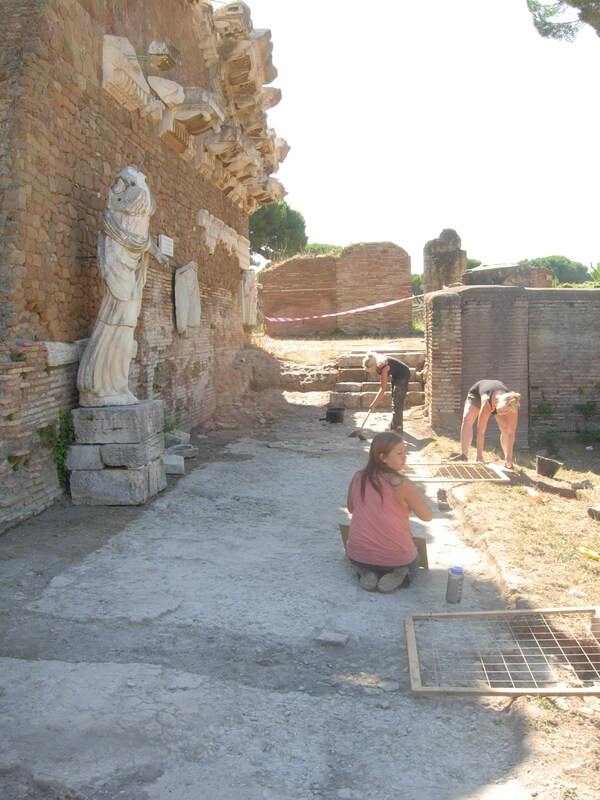 We would welcome experienced volunteers, resident in the Rome area, who have a good idea of the rigours and practice of excavation. They should contact us by leaving a comment on the blog below, or via email visible on the Univ. of Kent web page of Luke Lavan (google). Although we have had to suspend digging on one area, the recording has continued apace, especially on the forum, where the drawing team of Jo and Tina (also known as Minerva and Venus) has carried on apace. They are at present the only part of the team which is completely up to schedule, after having had a bad first week in which they had to abandon drawing a boiling hot cistern. Hopefully with new people arriving on Sunday, and a few volunteers, some momentum can restored. On the macellum site we are now into stratigraphic excavation, with samples being taken of foundation trenches and foundation layers for the 4th c. phase of the macellum. Marcus Dean has been digging into the north portico stylobate wall cut (see above) – whilst also acting as a guide for visitors – whilst Doug Watson (below) has sampled a rubbish deposit full of datable ceramics under the portico floor. 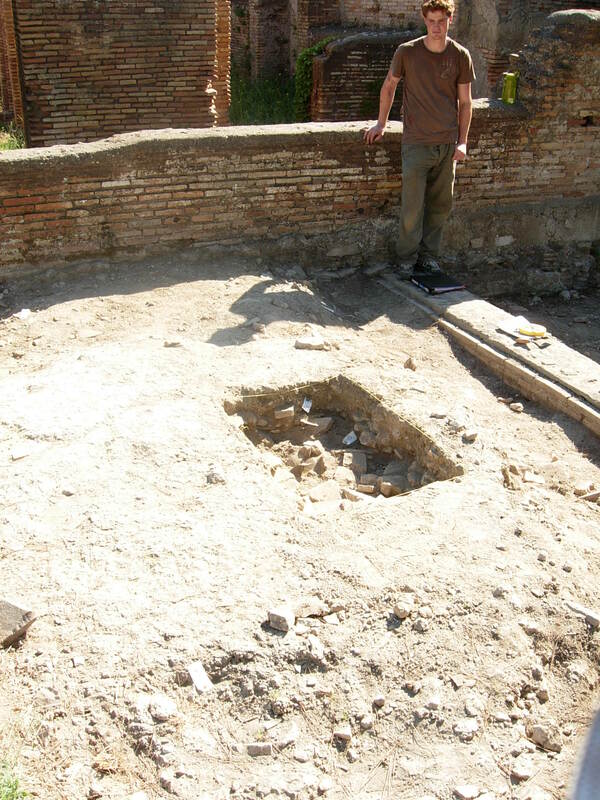 Zsolt Magyar has done a great job supervising the macellum team, and is also helping Paolo (one of our Italians ) excavate a couple of lenses of material on the floor of the nymphaeum. 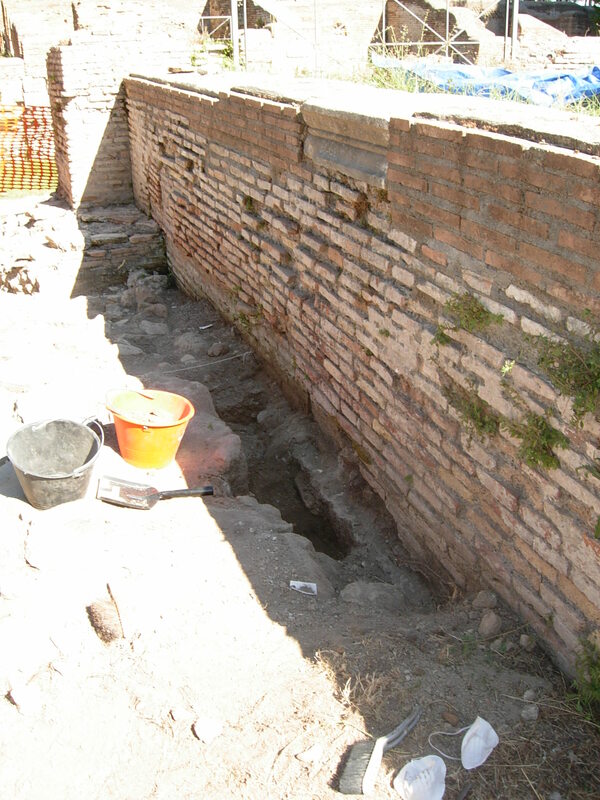 We hope to finish up digging the trenches in the macellum tomorrow and get on with drawing the sections. Really interesing web site, as always. “Shifting surveying pegs” … also a problem in thin rocky upland soils. Problem can be reduced if not eliminated by surrounding key pegs with concrete collar – get brightly coloured/high viz plastic bucket/larger flower pot according to taste; cut down to appropriate size if necessary; cut hole in base so that it can be slipped over peg; fill with concrete to desired level thereby providing some additional non-intrusive stability. To all the team – “keep up the good work”.